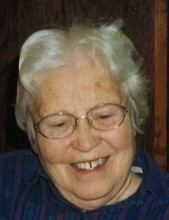 Ruth Shepard McGlachlin, 94, of Parsons, passed away at 4:20 p.m., Monday, January 28, 2019 at the Good Samaritan Society. She was born September 25, 1924, in Parsons, to Jacob and Hazel (Tranberger) Shepard. She grew up in Parsons and attended local schools. In 1943 she moved to Long Beach, California to work in the shipyards. From 1946 to 1960 she was employed by Woolworth’s Stores. She married John Saunders in 1946 and they later divorced. On October 8, 1966 she married William F. “Bill” McGlachlin and moved to Maricopa, California. They retired and moved to Parsons in 1990. Bill preceded her in death on January 20, 2000. Ruth enjoyed going to auctions, reading and eating homemade pie. She is survived by three sisters, Barbara Gofourth, Jo Good and her husband Gene, of Parsons and Kay Good of Chanute; sister-in-law Doris Shepard of Wichita; numerous nieces and nephews. Preceding her in death were her parents, three sisters, Frances “Sally” Morgan, Harriet “Ellen” Cornwell and Helen Good; sister-in-law Reva Shepard and three brothers Raymond Shepard, Donald Shepard and Russell Shepard; and four brothers-in-law Roy Morgan, Mark Cornwell, Delbert Gofourth and Kenneth Good. Funeral services will be at 2 p.m., Friday, at the Carson-Wall Funeral Home, with Rev. Wayne Mason officiating. Burial will be in Oakwood Cemetery. Friends may call at the funeral home Thursday afternoon and evening and the family will be present for visitation from 1 to 2 p.m., on Friday. Memorials are suggested to the Good Samaritan Society or the First Baptist Church. They may be left at or sent to the funeral home at Box 942, Parsons, KS 67357. Online messages may be left at www.wallfuneralservices.com. To send flowers or a remembrance gift to the family of Ruth (Shepard) McGlachlin, please visit our Tribute Store. Friends may call at the funeral home Thursday afternoon and evening and the family will be present for visitation from 1 to 2 p.m., on Friday. Funeral services will be at 2 p.m., Friday, at the Carson-Wall Funeral Home, with Rev. Wayne Mason officiating. Burial will be in Oakwood Cemetery. "Email Address" would like to share the life celebration of Ruth (Shepard) McGlachlin. Click on the "link" to go to share a favorite memory or leave a condolence message for the family.